The Hunt Museum is a jewel. Situated at the confluence of the River Shannon and Abbey River in the former Customs House in Limerick City, it is the repository of John and Gertrude Hunt’s collection of approximately 2,000 works of art and antiquities. These two antiques dealers followed their curiosity and their passion and gave the world everything they discovered. Their enormous private collection opened as a monument to their enthusiasm and generosity in 1997 in the renovated, Palladian-style 18th century building. Each piece was selected for its quality of design, craftsmanship and artistic merit, and ranges from Stone Age to Twentieth Century. Important pieces in the collection include the personal seal of Charles 1 of England, the Mary Queen of Scots Cross and a bronze horse by Leonardo da Vinci. 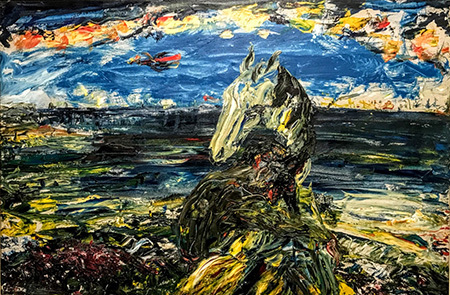 On my first visit, I saw two Jack Butler Yeats paintings, exhibited in an intimate room with an exquisite oil by William Leech (1881–1968), of a young girl that absolutely captivated me. Titled “Suzanne Botterell,” it would be overshadowed by works by Renoir, Moore and Picasso, but it was one of the stars of the collection for me. Another gem in the collection by Sir William Orpen (1878–1931) titled “A View from Howth Head towards Bray Head and the Sugarloaf,” was practically hidden in a corner of the massive Captain’s Room. 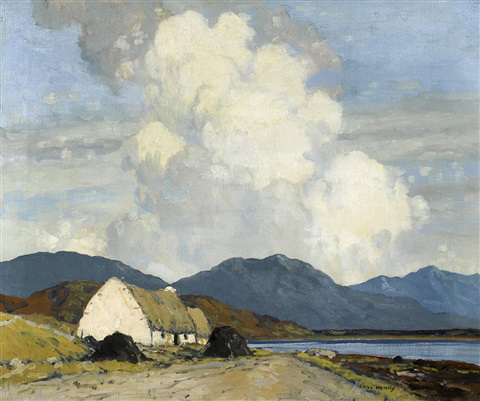 I was enthralled when I first encountered the work of Paul Henry at The National Gallery, Dublin and when I discovered more of his sublime paintings here at The Hunt, I was really excited. His work spoke to me. While a large part of the museum is dedicated to Prehistoric Ireland, and these ancient treasures explain the history of the Irish people, opening a window to the evolution of the Celtic culture that underlies the beauty and mystery of this island nation, it is the more modern painters that are the focus of this story. Small in square footage but monumental in the stellar works it houses, The Hunt Museum engendered the same sort of feelings I have for my beloved Phillips Collection back in Washington, DC. At the Phillips, you are experiencing the “eye” of Duncan Phillips (1886–1966), who began collecting works of French impressionism and American modernism in the early 1900s. The Phillips holds the most significant collection of works by Arthur Dove, whose soft, lyrical paintings evoke those of Paul Henry’s misty light of the west of Ireland. And then, The Phillips also has the largest American collection of works by Pierre Bonnard, an artist who fits right in with Paul Cézanne and Paul Gaugin, who had a strong influence on Henry when he lived and studied in Paris. Paul Henry (1877–1958) and Jack B. Yeats (1871–1957) were born about six years apart and died within one year of each other. They came together in 1920 to set up the Society of Dublin Painters, their paths to artistic prominence sharing some similarities, even though their painting styles couldn’t have been more different. 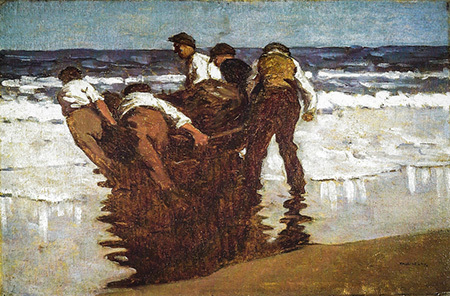 Henry was born in Belfast, Northern Ireland, and his interest in art led him to Paris in 1898, where he studied at the Academy Julian and later the Academy Carmen, opened by James McNeill Whistler. It was in Paris where he met his first wife, Grace, and after they married, they moved to London, where he worked illustrating books and magazines. In 1912, Henry moved to Achill Island in the west of Ireland. Here he found the magisterial mountains, big skies and thatched roofed cottages, that would infuse his spare oil paintings in which he recorded the traditional way of life. Henry’s more idealized railway posters, like Connemara Landscape, reached a wide and appreciative audience, and helped to catapult him to becoming Ireland’s best known artist in the 1920s and 1930s. In 1920, Henry moved to Dublin, where he stayed for twelve years. He then took up residence in Co. Wicklow with the artist Mabel Young, whom he married in 1954. Sadly, he lost his sight in 1945 and was blind until he died. The other half of the show features Jack B. Yeats, born in London, England. He was the youngest son of the well-known Irish portrait painter, John Butler Yeats. Jack’s brother, William B. Yeats rose to extraordinary fame as a poet and playwright and received the Nobel Prize in Literature in 1923. 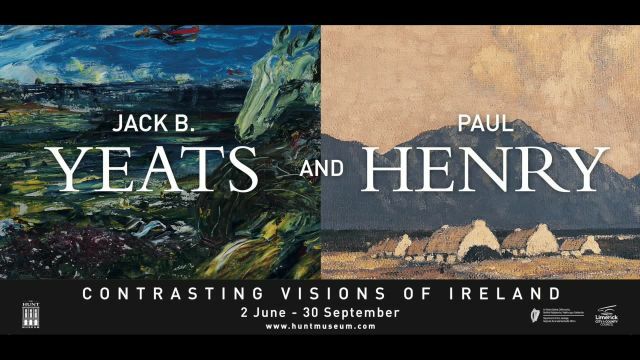 By exploring Paul Henry’s and Jack B. Yeats’s biographies, we discover some fascinating parallels. The first similarity is both painters were born in capital cities. The second similarity – Yeats grew up in Sligo, living with his maternal grandparents, so he had prolonged exposure to the west of Ireland, as did Henry later on. The third important similarity is, both artists worked as illustrators living in London – Yeats, when he returned to his parents’ home in 1887. And the last, rather amazing similarity is, when Yeats married Mary Tottenham in 1894, they resided in Wicklow, the same part of Ireland where Paul Henry and Mabel Young chose to live. However, when it comes to the physical creation of their art, as well as their subject matter, the artists diverged substantially. Paul Henry’s soft and often times muddy palette captured the landscape and simple rural life of the west, with a gentle application of oil paint. His work fell into the spectrum of post-impression. Yeats, on the other hand, from about 1920, worked very energetically, using thick, vigorous strokes, sometimes abandoning the paint brush completely. His extremely colorful work was distinctly expressionistic. 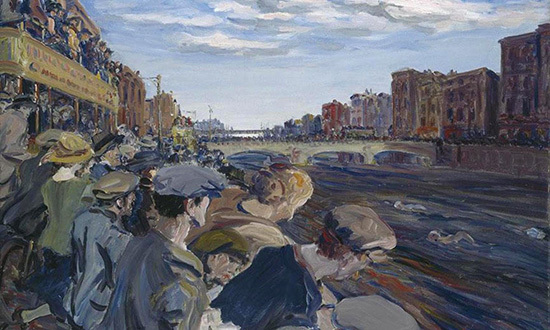 His subjects ranged from single figures, landscapes, horses, and the circus to scenes of great crowds like his painting of The Liffey Swim, which won a silver medal at the 1924 Summer Olympics, when an art competition was held simultaneously with the Olympic Games. Jack Yeats also developed an intense interest in theatre. He designed sets for the Abbey Theatre and three of his own plays were produced there. 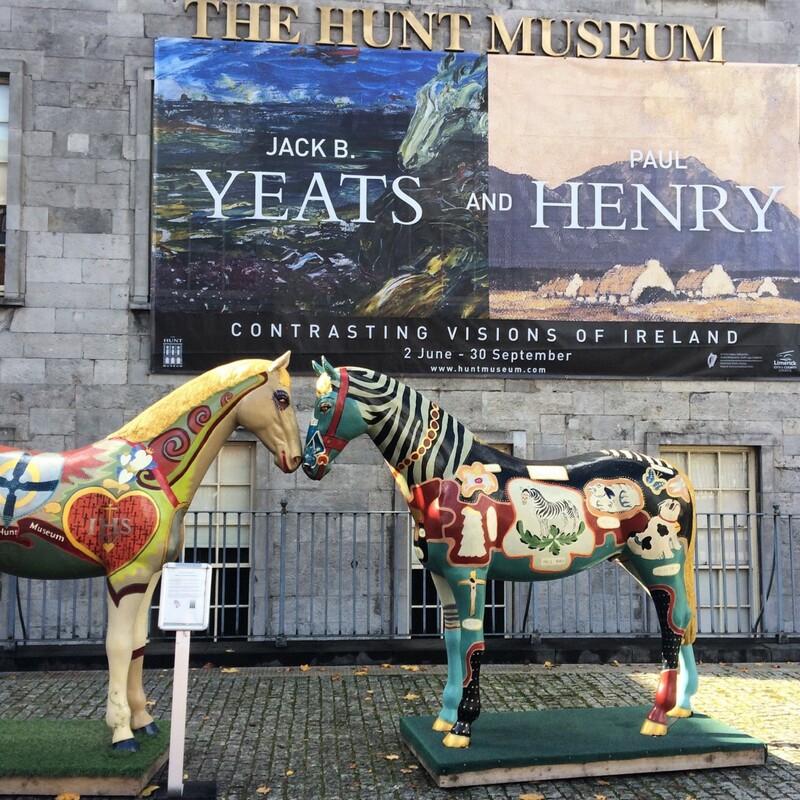 All in all, it was a fabulous exhibition juxtaposing two titans of Irish art. Taba Dale lives in Scottsdale, Arizona and County Clare, Ireland in the summer. She has been an art dealer for almost 40 years and takes every opportunity to travel and enjoy art.